Task: To automate a packaging line at Biscuiterie Thijs, a food company based in Herentals, Belgium, that produces waffles for supermarkets such as Aldi, Lidl, Carrefour, Albert Heijn and Jumbo. Solution: Install six FANUC M-2iAs equipped with advanced functionality, including iRVision, visual line tracking, load balancing, collision guard and an Ethernet encoder, to pick and place the waffles on the packaging line. 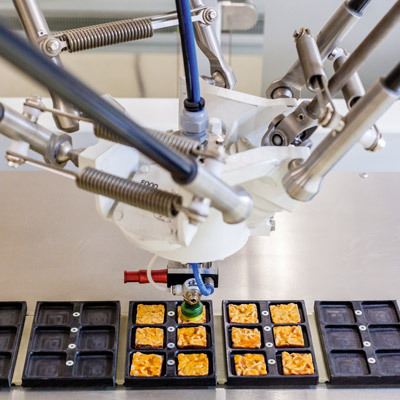 The number of waffles on the conveyor and their position is communicated to the robots via a camera and the robot controller, with the latter dividing the waffles equally among the robots. Using FANUC’s duo pick feature, each robot grips two waffles and places them on the line, saving time and enhancing transfer speed. Result: The robotic line is 50 percent faster than the old line. Plus, quality and hygiene has improved. There is also less waste since human operators were prone to breaking off the edges of the waffles, something the robots do not do. Biscuiterie Thijs in Herentals produces waffles for household brand supermarkets like Aldi, Lidl, Carrefour, Albert Heijn, and Jumbo. In 2013, the waffle maker decided to automate the packaging line of one of its production lines. The Dutch company Greymans Paktech has equipped the zone between the supply line and the actual packaging machine with a row of six delta robots of the make FANUC M-2iA. Geert Smolders, assistant manager of Biscuiterie Thijs: "We opted for robots to avoid human contact. It's better for the hygienic conditions, and it makes the line more profitable. We received more and more orders for this type of waffle, and we often had to produce larger quantities." "Initially, we wanted to hire more operators, but we could not find enough on the labor market. Few people want to do this kind of job, and sometimes, they are not able to do the handling work because it is intensive and requires a high level of coordination. A robotic line is faster. Previously, we were able to pack 300 waffles per minute, and now we can do 450, which is an increase of 50 percent." “This has significantly improved the quality of our waffles. We create less waste because the edges are not broken off so easily. The waffles we produce on this line are round and have a jagged edge. Therefore, they cling to each other and get stuck when they leave the refrigeration unit. The operators had to intervene and the fragile jagged edges often broke off." "M-2iA robots operate with an R-30iB control unit and integrate functions such as iRVision, visual line tracking, load balancing, collision guard, and an Ethernet encoder. The waffles are placed at random on the conveyor belt. Using these features, the robots pick up the waffles from the conveyor belt and place them on the packaging line. Each of the six robots therefore receives an equal load of the supply capacity. A major advantage of FANUC is that you can individually adjust each movement of the robot to create fluid motion." "The conveyor belt consists of two tracks. On each track, four waffles are placed one beside the other as they are packed by two. A strip correctly spreads waffles. Therefore, the cameras of the iRVision system are better able to detect the contours of each waffle. A camera hanging above each track scans the waffles. To further increase accuracy, we illuminate the conveyor belt from the bottom up. The camera detects the waffles perfectly." "The cameras are connected to the robot controllers. They transmit the number of waffles located on the conveyor and their position. At the same time, they divide the waffles among the robots. We have written the software ourselves to have the robots communicate with the packaging line. Each robot grips two waffles and places them on the line. By opting for the duo pick, we save time and enhance transfer speed." "We also experienced an extra challenge, since the supply chain should operate with the flow. The last row of robots has less than a meter to pack the waffles and place them on the line before they disappears into the flow packer. With FANUC software in the control units and iRVision, we are able to adjust the speed of pick & place depending on the speed of the line." "I am more than satisfied with FANUC. The software that came with the control units covered 70 percent of what we needed. 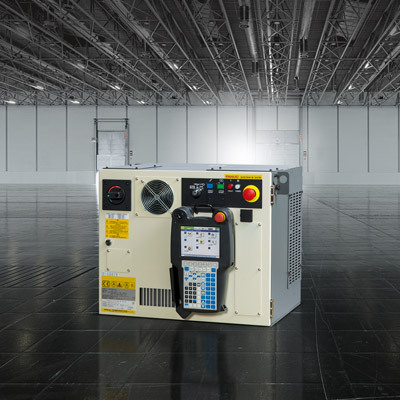 The remaining 30 percent was programmed with the help of FANUC. We have developed the overall pick & place process of the packaging line together, and the support we received was invaluable." "Technically, the packaging line is at a much higher level. The two cameras are the only control techniques that need to be considered. The other packaging lines are equipped with photocells, and because the new line involves fewer mechanical parts, there are fewer failures. Moreover, operators can clean the line three times faster than before. All this means that there is less down-time, and therefore, increased production."